I finished something other than a bird! I am hoping to finish at least one UFO a month this year and this is January’s. This is a bit of an unconventional baby quilt but after awhile, you get tired of pink and blue. This is also my 4th or 5th log cabin. They seem to my “thang”. I had to use my professional quilt hanger to take the photo tonight, my design wall is still in a box somewhere. I also debated on having this as a separate post or just to put it in with the bird post for the day. So I apologize if I have monopolized your feeds tonight. Thanks! This is probably my 4th or 5th log cabin. I’m addicted. wow…that’s really beautiful! I’m partial to purple these days and the contrasting colors really make the purple pop. question: I’m still pretty new to quilting – what color thread did you use for the actual quilting? Thanks! I had this one quilted by someone else. I am really not that good at free motion so I have my friend Karen quilt them for me. 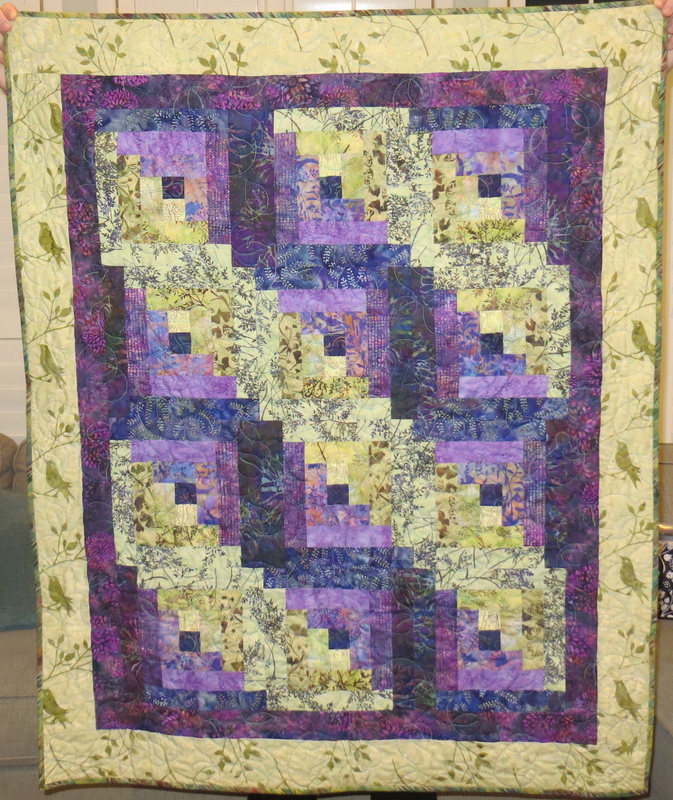 She used a variegated thread that went from green to purple. It was a pretty drastic variegation, not subtle. It turned out great. I usually just let her do whatever she wants. She has a very good eye. I will try to take a close up and post it for you. Thank you, it would be great to see a closeup. I’ve started my first quilt – a black & white crossword puzzle design and I’m torn with what color thread to use for the quilting…right now I’m leaning towards black. Are you going to stitch in the ditch or do something that goes across the fabric like a grid or all over design? I was thinking of stitching on the left and right sides of the ditch; both horizontal and vertical. I just posted some pics of my progress putting the quilt together…if you have a moment, let me know what you think. It looks great! So cool. If you are going to stitch to each side of the ditch and not in it, like a quarter inch echo, I would do black where it is black and white where it is white so that it blends and play it safe unless you want the quilting to be more of a feature. But I am not a big risk taker. That’s why I quilt with my credit card! !